Ironic the way things work out sometimes. I spent more than three years fundraising, producing and advocating for a documentary film deemed particularly hard to market because my subject, Jini Dellaccio, was an unheralded artist in her 90s. Now, I am witnessing an earnest debate around the film industry about women’s roles behind and in front of the camera. In recent weeks, multi-award winning BBC reporter and documentary filmmaker Olenka Frenkiel described how she was marginalized and seemingly ‘rubbed out’ while male colleagues her age, if not older, thrived. Meanwhile, Hollywood stars, Renee Zellwegger and Julia Roberts got caught up in controversy surrounding their looks, whether to age gracefully on camera or succumb to a nip and tuck to keep their careers in full swing. It feels like my entire filmmaking journey with Dellaccio to share her unlikely story trail-blazing her way through male bastions like photography and rock n roll more than 50 years ago, has paralleled this current zeitgeist. I wonder too what our film festival audiences think of all this, having witnessed a vivacious woman well into her 90s tell her own story, with such engaging wit and charm, on camera for 70 minutes? I am not going to list my own battles in this realm, but you can file them under ‘women’s stories are not niche’ alongside all the other anecdotes and statistical reports that disseminate gender bias, ageism and sexism in media. I do want to raise a question or two: How much is our marginalization as filmmakers, journalists and artists so endemic in our culture, it pervades all our efforts to make progress? Can we fight narrow perceptions through our storytelling and create a level playing field to reach wider audiences in the near future? In my opinion, the world needs a history of confident and talented women, and we have to keep telling these kind of stories and advocating for more mainstream take up. It is the only way to change this fundamental dynamic of women evidently not being reckoned with as the ‘real’ market when it comes to film. My own work has always been fueled by my fascination with ways of seeing (image versus reality), and the visual impact of the documentary process. You need to go beyond the camera’s frame to truly understand people’s lives and matters of identity and roles, but I am compelled by what is portrayed on screen. The promise of independent filmmaking for me, is that you can forge your own support structure and network, particularly from the women in film community, to peel away from what is expected and frame something different. 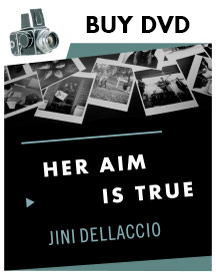 Hopefully I achieved this with my portrait of Jini Dellaccio in Her Aim Is True. I now want to challenge myself and audiences further, by stepping behind the scenes with another groundbreaking artist, the conceptual photographer Suzanne Heintz. Heintz has taken an extreme and bold approach, using her artistic eye to challenge stereotyped images and expectations about women’s roles and our lives. Increasingly rattled by perceptions that she was somehow unfulfilled because she was unmarried, although she had a successful career, Heintz found an answer in the power of the still image and using mannequins as her symbolic props. Posing alongside the mannequins and donning 1950s Doris Day-esque attire, Heintz captured classic ‘Kodak’ moments of a ‘perfect’ family. Everything from vacation ‘snapshots’ to Thanksgiving and Christmas gatherings, has been cleverly defined in her photography series she calls ‘Life Once Removed’. Heintz has also embarked on three film shorts under a spin off project, entitled “Playing House “, which looks set to delve far more deeply and in her own words be ‘socially provocative’. It sounds outrageous, but by creating an artificial family, Heintz is definitely hitting a raw nerve especially in the context of the current debate. I am also completely drawn to the fusion of photography, film, performance art and satire that I see in Heintz’s work. What drives Heintz to put herself out there, crossing the line as she does daily, weathering accusations of being the ‘crazy’ mannequin lady? I think audiences will be intrigued, entertained and moved by Heintz’s exploration of our strive for perfection and that gap between image versus reality under scrutiny of her lens. After my conversations with Jini Dellaccio, I knew the story I wanted to tell was about how one woman’s commitment to music, art and pioneering creativity led to an extraordinary life. Dellaccio found the creative courage to take on photography, shoot rock and defy traditional notions about gender, age and roles in the 1950s and 1960s. This is why I also empathize with Suzanne Heintz’s commitment to her project, and ambition to move us away from outdated mindsets. Evidently, I may still have to contend with my vision as a filmmaker and subjects being considered “niche” but it won’t stop me or my subjects from believing in the art of the possible and what we can do with our vision.